Fundamentally, there really is no such thing as “NB-IoT”. The correct term is “LTE Cat NB1”. This technology is sometimes confused with Cat-M, which is another misnomer. The correct name for “Cat M” is LTE Cat M1. 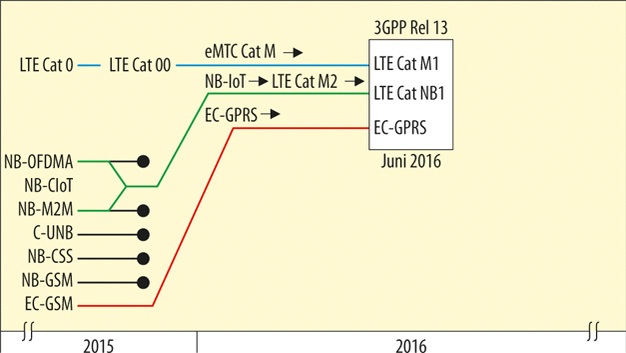 Both these technologies, LTE Cat NB1 and LTE Cat M1 are just subsets of “classic LTE” and are a part of the 3GPP Release 13 fixed in June 2016. Many people are aware of the Cat9 compatibility of the iPhone 7. LTE-Cat9 can support up to 450 MBit/s in theory in contrast with LTE Cat NB1 that offers only 20 Kbit/s. The name LTE Cat NB1 implies that it may be succeeded by a technology called LTE Cat NB2 or something similar. An NB2 would be possible since LTE base stations are software defined radios (SDR) and support this type of enhancement. The same is valid to LTE- Cat M1 – a version M2 can follow later on. The 450 MBit/s on LTE-Cat9 have disadvantages and drawbacks in wireless IoT and M2M. A high speed will force a high calculation power and high-end digital signal processors (DSP). At LTE Cat NB1 and LTE Cat M1, we have the opposite. The complexity of the chipset is lower than at LTE Cat1. This will reduce costs. Moreover, the lower the communication speed on a radio the better the sensitivity of the receiver is. Just compare it with the data sheet of your Wi-Fi router at home. This is valid for all radio modules. At 54 Mbps the Wi-Fi signal will theoretical travel 109 meters in free space. At 1 Mbps the same device will reach 1543 meter. I will come back on my words and the words of my business friends soon. Not all of the are radio engineers. However, 50 billion connected things by 2020 will need a lot of embedded antennas because wired 50 billion connected things are impossible. Do not hesitate to drop an email to harald.naumann (at) gsm-modem.de . I will be happy to support your wireless IoT / M2M project as well. Thank you for the support to Joe Hubert from US. Joe is one of the first “students” at the IoT-University and supported me during writing my IoT/M2M Cookbook as well.